Whenever we access the nest ledge of the Richmond falcons we keep an eye out for prey remains. These give an accurate picture of the diet of these falcons. In the past we’ve identified a number of different prey species. We commonly fnd pigeon remains and yellow-billed cuckoos are another species these falcons seem to favor. We’ve found purple martins, chimney swifts an american woodcock and even a bat. 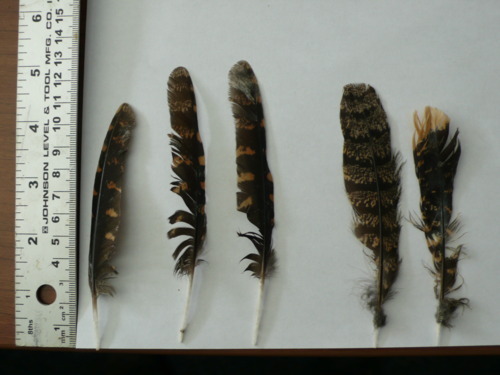 During this year’s banding we found some feathers that we hadn’t seen before – requiring a little bit of research to identify what this bird was. This bird is widespread in the East and is rarely seen; possesesing amazing camouflage. The distinctive calls of this bird ring out in the night and give the bird its name. We’ll post the answer to this feather mystery in a few days.